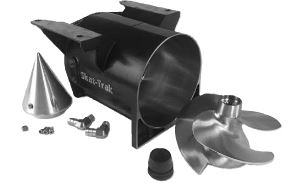 Skat-Trak Kawasaki SX-r Pump designed specifically for race applications and maximum performance. Fits all OEM Kawasaki SX-r, Bullett Racing, Kommander K1, Trinity and WWR hulls. Pump (C+83) Specifications: 145mm, 83mm hub, 14 Vein, Setback, Skat-Trak tail cone, Skat-Trak impeller and extended drive shaft.